Nycomm celebrated International Women’s Day by gathering many women from across the business to showcase female talent. 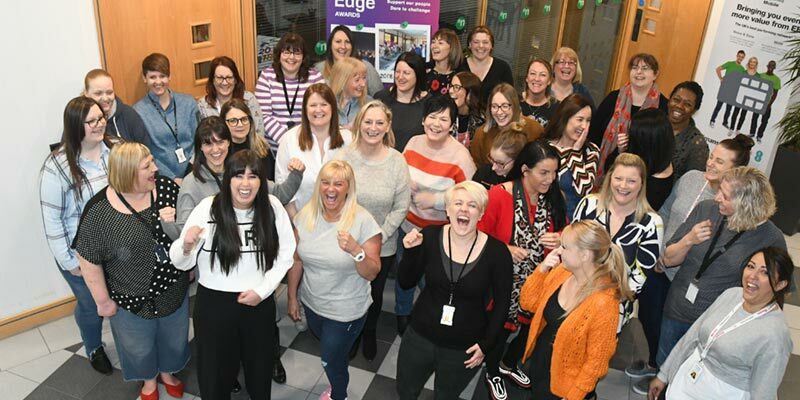 Dozens posed for a special photo to celebrate the day as PR Manager Chris Widocks shouted ‘Girl Power’ to generate lots of smiles. We’re really proud that we have a strong representation of women in all roles here at Nycomm, who help us achieve growth and contribute to the business. Nycomm has announced a new environmental management partnership with a pledge to divert 100% of its waste from landfill. 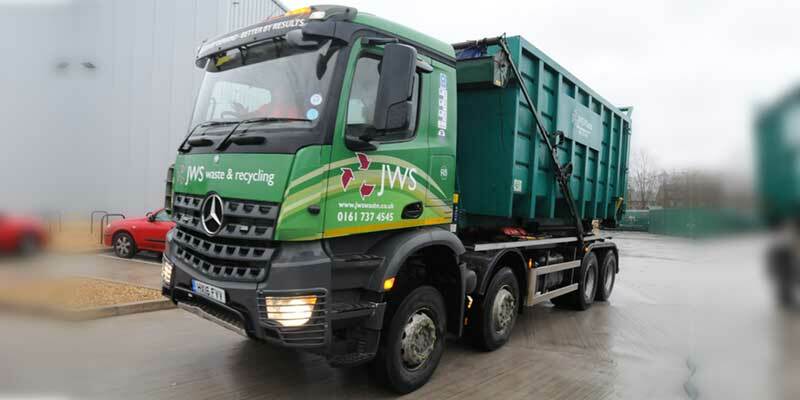 The Group has teamed-up with local specialist JWS Waste to reprocess over 100 tonnes of waste consisting of tonnes of card, paper, plastics and general waste. “JWS Waste are now our dedicated waste partner and are working with us to provide a sustainable waste service – diverting 100% of our waste from landfill,” confirmed Nycomm Distribution Centre Manager, Chris Musgrave. A new tribute in memory of our founder Julian Niman has been unveiled – and it’s got visitors and staff buzzing with interest. Nycomm made a successful auction bid to secure an iconic bee sculpture which has been placed at the entrance of our HQ, previously renamed Julian Niman House. 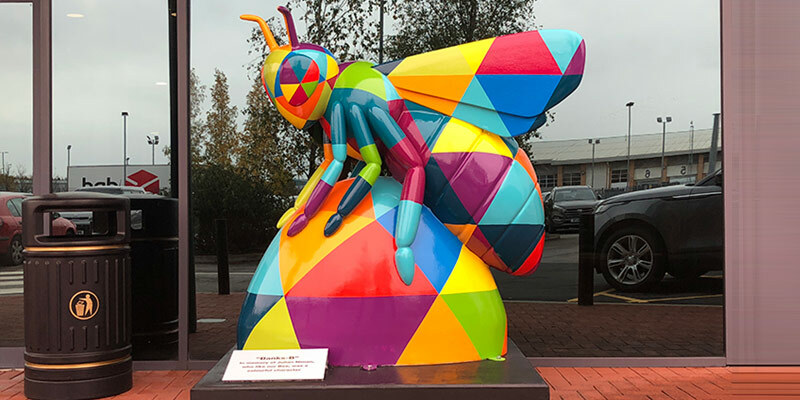 Over 70 painted bees adorned various parts of Manchester this summer and were recently sold to raise over £1m for the Lord Mayor of Manchester’s We Love MCR charity. Julian passed away in January this year, having built Nycomm into a £121m turnover operation. He was aged 64. 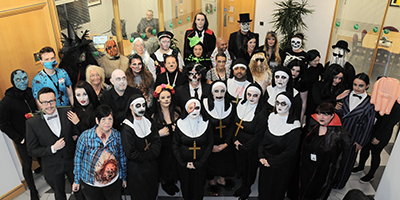 Nycomm was a scary place to work for one day only when dozens of workers dressed up to celebrate Halloween. Nycomm cooked up a charity treat by hosting a staff BBQ which raised hundreds of pounds for a local food bank. Developed by our Mars Group, the event was spearheaded by ‘masterchefs’ Gary Redshaw and organiser Natalie Wynn, supported by fellow organiser Hannah Elly and Esther Park. 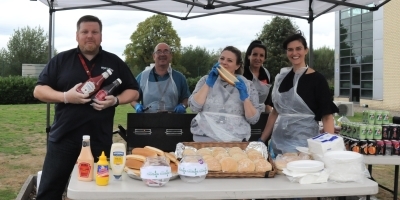 The main lunchtime get-together was held at Julian Niman House as staff enjoyed burgers, hot dogs and ice creams – despite some cool and windy weather. Mars Group representatives in other locations were also busy feeding their colleagues, with an office picnic in Leeds (thanks Emma Smith), pizza & ice-cream in Bury, pizzas at Trafford Park and a nice hamper for the team down in Bristol. The Videonations team opted for an early-autumn pizza instead. In total £450 was raised for Salford Food Bank. 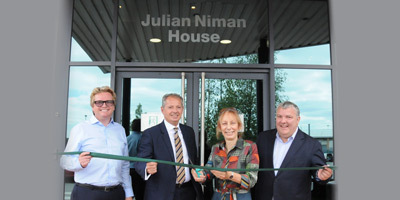 Our Manchester headquarters has been renamed Julian Niman House, in memory of our former Chairman. Julian Niman helped build Nycomm into the country’s biggest independent comms distributor and passed away in January, aged 64. He was known as a true industry legend. Julian’s wife Sue Niman was on hand for the official ribbon cutting ceremony watched by the company’s Agecroft workforce and flanked by the board of Directors. A few days earlier the Board of Directors invited all the senior managers to an off-site strategy meeting as Nycomm aims to hit the £200m turnover milestone. Nycomm’s very own team of superheroes battled the heat to raise thousands of pounds for Manchester’s Brain and Spinal Injury Centre (BASIC) in a company-wide charity venture – inspired by our former Chairman Julian. Thirteen colleagues completed the Manchester half marathon in blazing temperatures – with Marketing’s Tom Hague first over the finish line for Team Nycomm in a time of 1.51hrs. In addition a group of seven completed a 10K event afterwards. 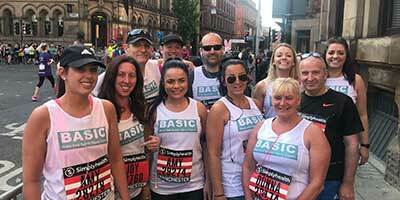 Everyone ran in support of BASIC which provides a wide range of centre-based support – including virtual reality rehabilitation – for those recovering from brain and spinal injuries, as well as their families. 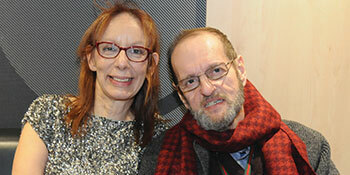 BASIC also supports Epilepsy sufferers, a condition which affected Julian who sadly passed away earlier this year. Nycomm showed its love to staff by celebrating Valentine’s Day with chocolates for all employees. 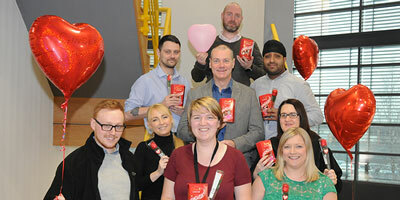 Around 370 workers arrived for work to a box of chocolates on their desk as balloons and other themed decorations made it a day to remember at various sites across the Group. At Nycomm’s Manchester headquarters a month long sales incentive incorporated various games and spot prizes whilst at our Rocom offices in Leeds a ‘Blind Date’ contest was part of a fun-filled day. Julian Niman the founder and chairman of communications group Nycomm has passed away. The 64-year old died at his Manchester home on January 12th. Fellow Director and friend David Bennett said Julian regarded all his staff as family. He said it was a huge shock but stressed the board of directors will continue to run the Manchester-based company as ‘Julian would want us to and continue his legacy’. David told the workforce: “Julian saw all of us here as his family and he would want us to carry on serving the customer and running the business in his memory. 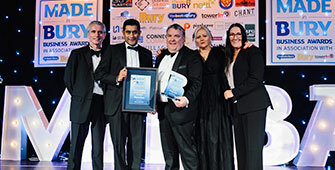 The Nycomm Group is celebrating a new awards success after data, networking and communications specialist Pennine won the Outstanding Achievement title at the Made in Bury Business Awards (MIBBA). The company is one of the key divisions of the Nycomm Group having been acquired in December last year. It boasts a blue chip client base and is recognised as a major player in the communications sector, both locally and nationally. Pennine’s managing director Andrew Roberts accepted the award from the leader of Bury Council, Rishi Shori, at glittering awards night. Founded in 1976 as a two-way radio specialist, Bury-based Pennine employs 75 staff and offers a broad range of communication services. The £17m turnover business joins an elite band of companies to collect the MIBBA accolade with previous winners including JD Sports. Nycomm has bid a fond farewell to Operations Director John Cunningham as the curtain comes down on a 20-year career with us. John was initially recruited to implement a new computer system in the late 90’s before playing an instrumental role in developing the company’s acclaimed logistics operation and planning a new Agecroft HQ warehouse expansion. “The company has grown dramatically over the years but there are many things that have stayed the same; the family atmosphere and Chairman Julian Nimans’ passion to achieve even more success,” he remarked. John’s many farewell gifts included a new bench for his garden, a book of photographs of theatre legends and theatre vouchers. He says he’s looking forward to taking up ballroom dancing, travelling the UK, walking, firing up his Harley Davidson and directing more theatre productions. Communications supply specialist The Nycomm Communications Group has announced a major new expansion by creating a specialist two-way radio hub following the acquisition of Bristol-based Co-Channel Electronics. 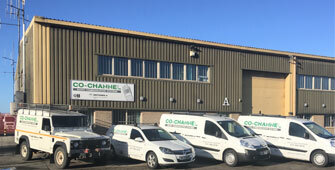 Founded in 1978 Co-Channel specialises in two-way radio and wireless communications and serves a broad range of clients across the West Country. 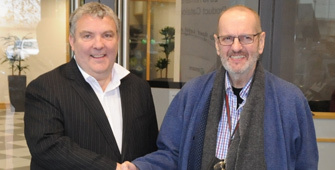 It’s the latest name to join the Nycomm ‘family’ of businesses following the purchase of Bury-based communications and data specialist Pennine in December last year. This latest deal expands Nycomm’s nationwide geographical reach and provides Pennine with a compelling new platform to move further forward. 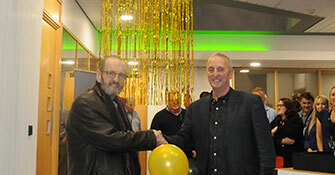 Co-Channel’s staff and operations will be integrated within Pennine’s national PennineRadio division and its Bristol premises will be retained as a regional technical and sales support hub. Pennine already provides two-way radio installation, supply and maintained contract services to an array of private and public sector organisations across the country including the Hinkley Point C construction site in Somerset. The acquisition is the latest to be completed by The Nycomm Communications Group of Companies since it snapped-up Pennine late last year. The £100m turnover Group is gearing up to hit the £150m revenue mark. The Nycomm Communications Group is delighted to announce a major new acquisition as Pennine becomes the latest addition to our growing ‘family’ of businesses. Pennine is a successful and growing business that has been operating in the communications sector for over 40 years – a well-respected distributor and provider of unified communications, mobile solutions, cloud and IT services as well as its original specialisation in Two-Way Radio. The Pennine Group is also a distributor of the analogue and IP handset businesses Interquartz UK and Yealink UK – and is set for further growth under the Nycomm umbrella. Generating annual turnover in excess of £14m, this new addition will take the Group to over £100 million revenue. It also gives us an unparalleled product portfolio in radio, telecoms, UC, hosted, IT services, hire, video, consumer and peripheral products which will help build growth towards our next target of £150 million turnover. In addition to the unparalleled portfolio of products, Nycomm also benefits from the addition of Andy Roberts, who was Managing Director of the Pennine Group, to our board. 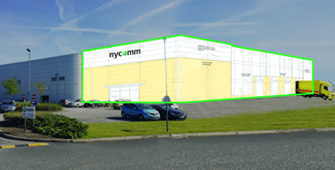 A major warehouse expansion project has been announced as The Nycomm Communications Group continues to move further forward. Work is set to start in the coming months to increase floor space by over a third, with the multi-million-pound scheme due to be completed by the Summer. Operations Director, John Cunningham says the new investment represents a high profile symbol of how the Nycomm Communications Group is gearing up for an even brighter future. Architect’s designs have been produced and the tender process has started. Watch this space!